The first card from the new trial deck appears!…to not be a Zodiac Time Beast. AUTO: When this unit is placed on R, you may reduce its Grade by 2 until end of turn. 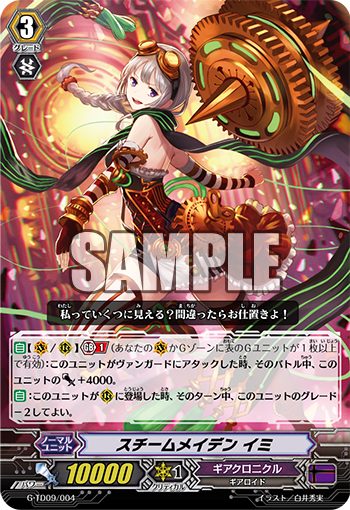 Today’s card is the Grade 3 《Gear Chronicle》 Unit “Steam Maiden, Imi”, from the Trial Deck “True Zodiac Time Beasts” on sale September 30th! • During a battle in which it attacks a Vanguard, it gains Power+4000. • When it’s placed on the field, its Grade is reduced by 2. Since the Gear Chronicle clan ability, 【Time Leap】, can’t be used on Grade 3, an ability that reduces its Grade is quite handy. Call it ahead of time as a choice for 【Time Leap】, so it’s good to put into your Deck! It has roughly the same ability as cards like “Square One Dragon”. “Steam Maiden, Imi” can lower her Grade at no cost, so even if you have no Soul, it can lower its Grade. So if you use too much Soul due to “Steam Scara, Gigi”, even one copy is fine. There’s plenty of cards that support 《Gear Chronicle》 in “Gears of Fate” which goes on sale the same day. So be sure to expect more information in the future. Q. Please explain to me the procedure for Time Leap. A. “Time Leap” works like this: You place the Time Leap Unit in the Bind Zone, then you search your Deck for up to 1 card whose Grade is +1 that of the Grade of the Unit placed in the Bind Zone. And, when that turn ends, the Unit called by Time Leap from the Deck is returned to the bottom of the Deck, and then the Unit Bound to Call that Unit is Called.